Ten skippers showed up at Sandy pond early on Saturday to race the first one of the four Footy races for this seasons series. The weather was sunny and cool with gusty winds coming from the WNW at 11 to 15 mph. 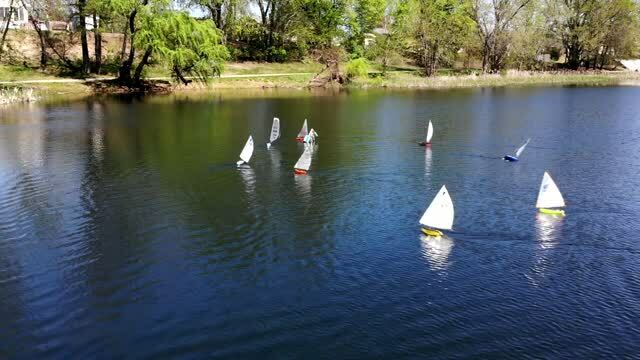 This was the first big one day event at the pond for the Nashua Model Yacht Club. The Nashua Local Public TV station arrived and did some drone videos of the boats sailing around the marks. All of the skippers that came from other parts of New England enjoyed the pond and said that they would like to sail it again. Racing started around 10 am and we all stopped for lunch for a half hour. Racing continued into the afternoon with a lighter breeze and we finished around 3pm. A total of 13 races were raced and two throw outs were agreed on for the number of races completed. The race Results are as follows with throw outs. Nick from Nashua Parks and Recreation Department who let us use this pond for these events and helping keeping the Sandy Pond clean. Photographer Shawn as he kayaked out on the pond and took some great shots. Thank you all!! and Keep the wind in your sails!!!! !